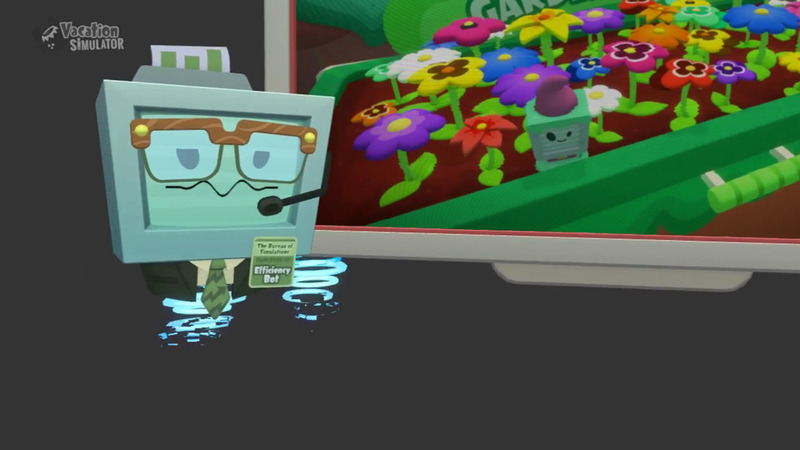 As a day-one launch title for HTC Vive, PSVR, and Oculus Rift’s Touch controllers, Job Simulator (2016) was an ideal first VR experience; it’s so simple anyone can immediately put on a headset and get to exploring the comically bad interpretation of what human jobs must have been like after an apparent robot takeover. Now a few years later (it’s 2060 if you’re keeping track), the robots are again back at their antics, this time trying to recreate the lost art of vacationing. By this point, you’re probably asking yourself whether Vacation Simulator is more of the same. It is, and it isn’t. And those are both good things. 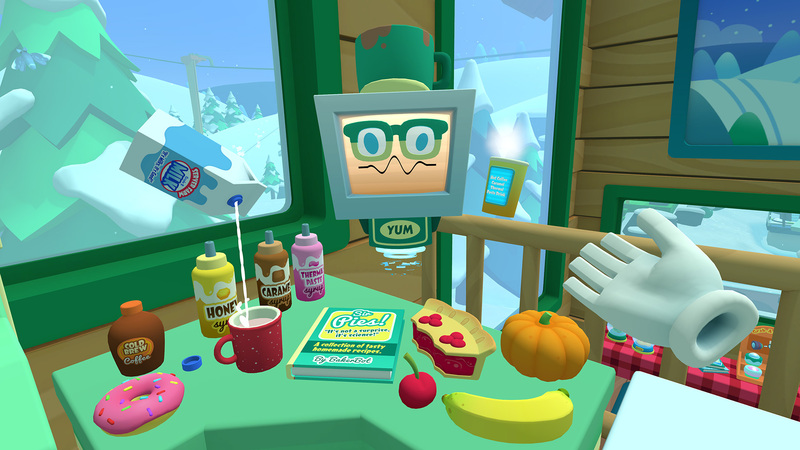 Like Job Simulator, its new laid back younger sibling is very much built on a few of the familiar core concepts of funny and weird object interaction; you’ll immediately recognize things like photocopiers printing actual 3D items, computers with binary keyboards, quippy robots, and plenty of whimsical food preparation (turn an instructional guide into a waffle! cover it with motor oil! eat it!). The sequel however is all about offering up a vast array of smaller activities in a variety of vacation locales, and setting it all under the umbrella of a singular story line. Here you’re given free rein to move about the three vacation spots—the beach, the forest, and a mountain area—at your own pace and basically engage in whatever task you want, and in whatever order you want. Each task completed earns you a ‘memory’ which is automatically tallied to your wristwatch; you’ll need five of these memories from each area to access a level’s single extra zone and reach a new piece of the story. The robots desperately want to figure out how humans vacationed and why, but you’re always bucking up against the boss of the whole affair, Efficiency Bot, who can’t help but quantify everything in hopes of delivering a simulation that’s perfectly optimized. Your friendly guide, Vacation Bot, is your main pal, and believes humans actually vacationed for fun (of all things) and don’t need optimizing. The story is linear, and pretty simple, but it makes for a nice way to tie everything together. Each area has around a dozen bots, half of which are main quest-givers. That said, there’s a pretty surprising amount of stuff to do, offering everything from building puzzle-like sand castles on the beach, to painting with an extremely chill Bob Ross-inspired bot in a tree house in the forest. I’ll talk more about NPC interaction in the Immersion section below. It’s safe to say though that each individual player will find some activities boring, and others more exciting, so it’s really up to you how to play the game. 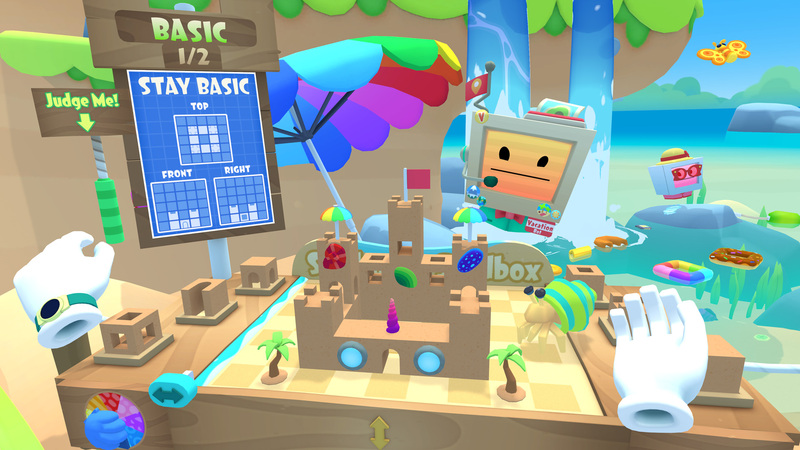 You can go about sampling all of the activities to earn a basic-level memory, or in many cases go on to complete all three difficulty levels in a single activity to earn all three. If you choose to go the ‘easy sampling’ route, only in the last bit of the game do you really need to drill down and complete a few more intermediate-level tasks to get past the final stretch, which requires a total of 30 memories collected across all three vacation spots. Even though you’re required to complete a certain number of tasks to move forward in the story line, you’re pretty much left to your own devices to do whatever you find the most interesting and fun. Personally, it was a really nice change of pace that actually ended up feeling pretty relaxing. 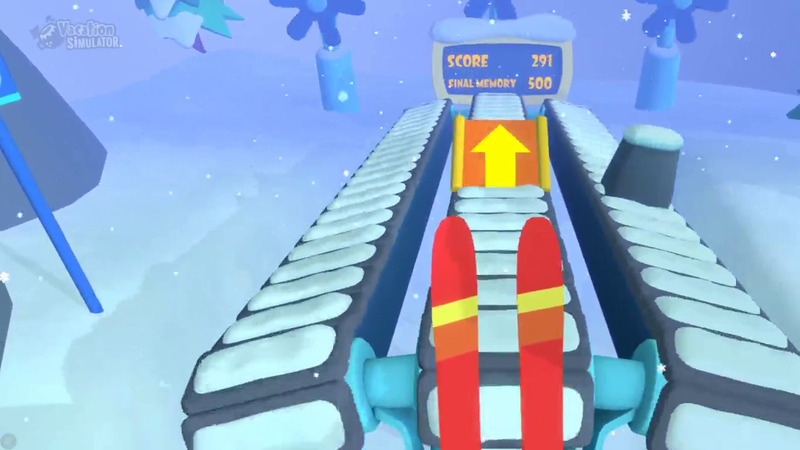 My personal favorite mini-game was a skiing machine that made you shift your controllers left and right to avoid obstacles. Hitting a jump speeds up the treadmill and tilts the whole machine downward for a really cool (and comfortable) jump effect. My least favorite has been and always will be cooking. I don’t know why, but to me it’s not appealing, and it was nice to skip it entirely in favor of puzzles and movement-focused activities like playing ball or hunting for hidden targets with a slingshot than making a weird burger and playing delivery boy. 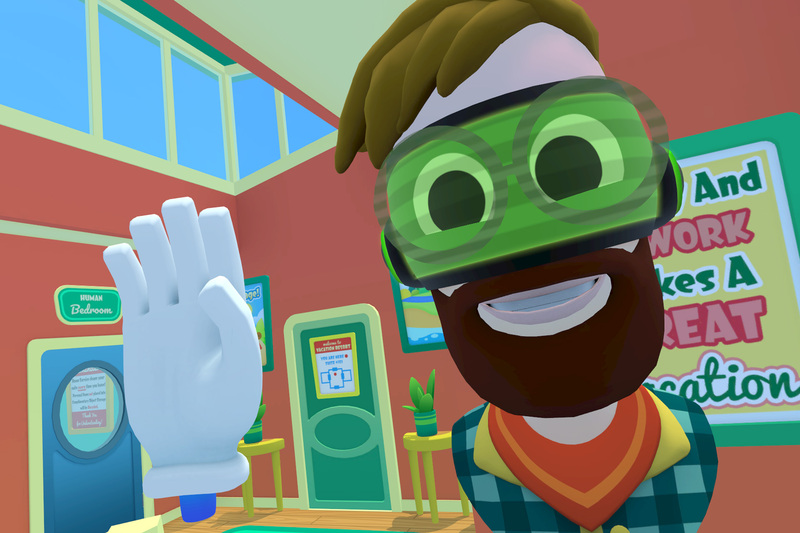 I would say it’s still a great first VR experience, which is probably why it’s coming to Oculus Quest at some point this holiday season. It decidedly puts a bigger helping of meat on the bone for the series while staying accessible to pretty much anyone. Personally it didn’t serve up any belly laughs, but it’s definitely a quirky, sweet brand of humor that starts to grow on you. It’s corny, but in a really endearing way. I can also imagine it wasn’t easy striking the right balance between the extremes of giving users a rigid set of A-to-B instructions, and throwing them into swath of disparate activities willy-nilly. 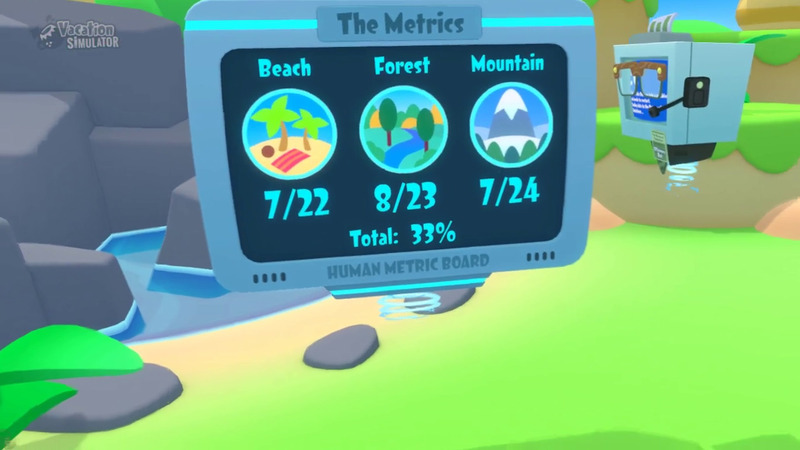 The game is pretty self-aware of this fact, and it’s largely reflected in the conflicts that play out between Efficiency Bot and Vacation Bot. In the end, Vacation Simulator is a little bit of both, and I personally found it more appealing than Job Simulator in that respect. Going for the bare minimum, I completed Vacation Simulator in around 3.5 hours, although there’s still a mess of activities left to do if you want to dip back in with an all-access pass to the entire game. There’s also collectibles everywhere, including game cartridges that you can play back on an old school tube TV at your home base. They’re simple little games, but they’re a much more substantive than your bog standard ‘find a thing for points’ collectible type. 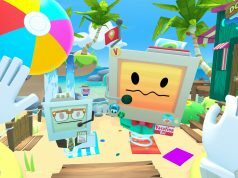 The bright and cartoony world of Vacation Simulator is pretty low poly, yes, but it’s also a really well constructed place that owes much of its immersion to the hard-won object interactions pioneered in Job Simulator. Here you’ll find yourself messing around with and easily snapping things in place that need to be, like ingredients in hamburger, a sandcastle piece, or a cheeky polariod snap from your trusty camera. These Lego-style objects truly take the fuss out of interacting with the world’s objects. 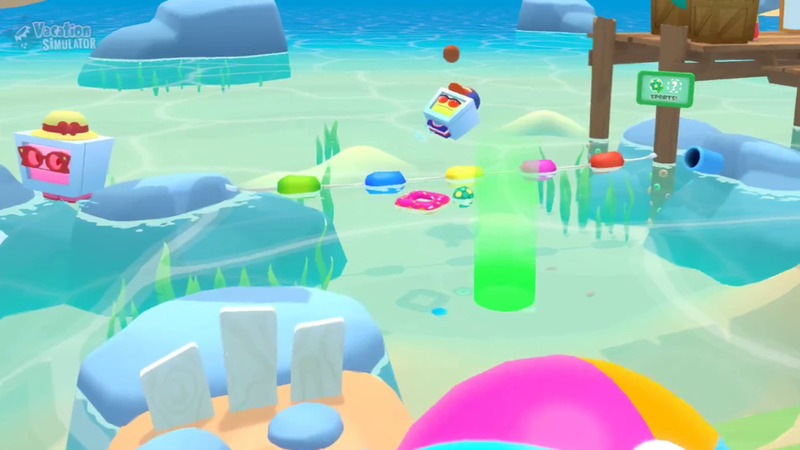 You’ll also be ferreting some objects from one vacation spot to another though, so the game also comes with a backpack mounted to your back, which you can whip out simply by reaching behind you. There’s little more immersion breaking than having to paw through a floating 2D inventory, so this was a nice touch. The avatar builder is also a newcomer to the series, and while I personally don’t think a single player game really needs one, Vacation Simulator puts an emphasis on sharing selfies and in-game photos. Just like Job Simulator though, you’re a floating head and pair of hands. This personally doesn’t bother me, but I can see how it might detract from immersion in general. You can also set up an experimental camera to record video, which you can use to mirror to your monitor for a more realistic peek into the action for streamers. As for interacting with NPCs, it’s dead simple: just wave at the bot in question and they give you a task. It’s a far cry from having to press a button to choose a response, or start a conversation, and while it removes some of your personal agency, it’s a lot more immersive being able to simply wave and initiate a conversation than being bombarded with quest prompts, effectively leaving you to wander around and experience the world at your own pace unabated by the actual mountain of tasks ahead of you. Nearly everything about Vacation Simulator goes off without a hitch, and that’s a pretty important cornerstone of immersion. If you can’t trust the world around you to react like it should, the spell of immersion is essentially broken, and you start to get frustrated with technical aspects when you should be having fun in the game’s delightfully weird little world. One thing I couldn’t find though was a setting for a two-sensor setup which would allow me to snap-turn. This wasn’t a deal breaker, as most activities were front-facing, although I would’ve liked the option to let me take everything in a bit easier. 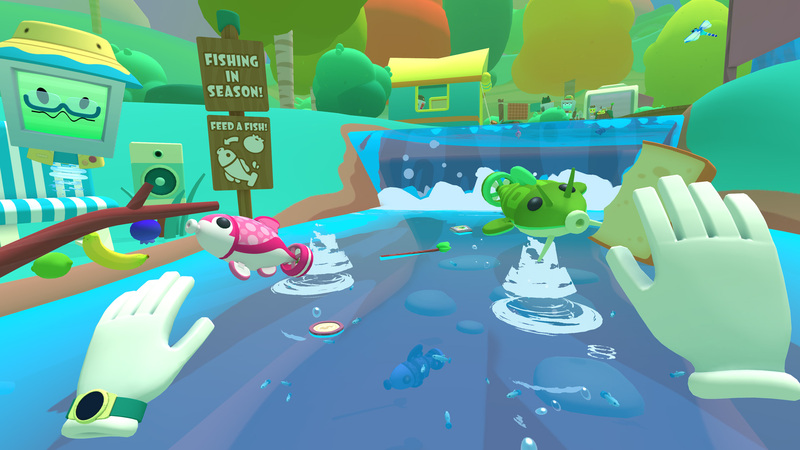 Because the game introduces a new freedom of movement, moving around is handled by way of node teleportation, much like Owlchemy Labs’ game Rick and Morty: Virtual Rick-ality (2017). Each activity has a single node and a standard size room-scale play area of around six feet squared (or two meters). Teleportation in any form is pretty much the most comfortable methods for artificial locomotion. The rest is done with room-scale movement, which is by far the most natural way of experiencing VR, and also as comfortable an experience as walking around in the physical world. Thankfully, if you’re a seated player or shorter than average, you have a few tools at your disposal. While there’s no bespoke ‘seated mode’, you can resize the world to be smaller, which essentially makes playing seated more of a possibility. You’ll find that in the backpack, which houses the game’s basic settings. Tables themselves also have adjuster bars, so you can bring them higher or lower depending on your height—great for popping little ones in the game for a quick session. On the surface level. 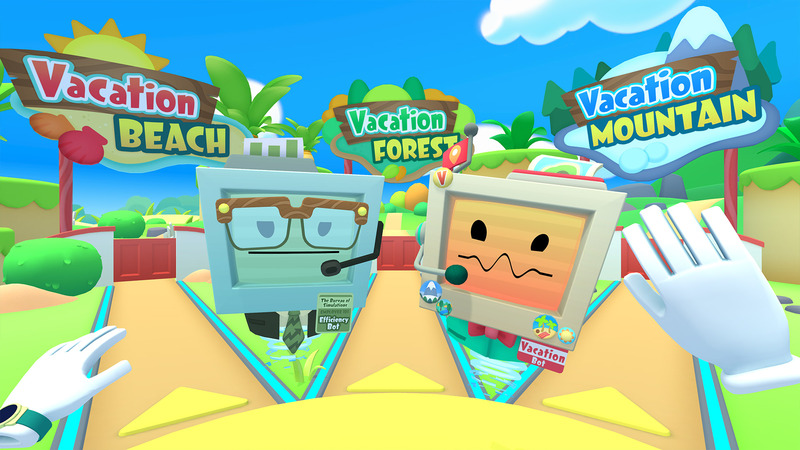 'Vacation Simulator' is a seemingly familiar dive back into the whimsical world of 'Job Simulator', although this time around the studio has added a fair bit of structure and story to the game that really gives the vacation-focused sequel some much needed legs. Since you're given a wide swath of activities and only a few requirements to complete them, you're basically left to your own devices to have the most fun you want to have. In the end, it wasn't as relaxing as a vacation, but I certainly came out the other end with a smile on my face and enough reason to go back in after finishing the main story line. 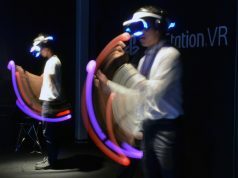 I loved Job Sim for it’s introduction to VR back in 2016 , the interaction got the imagination about VR going. Though the content itself was shallow, I don’t find the humor even a bit funny though but it sounds like there is more story here so I’ll check it out. I agree, and for me it was one of those games that was great during the pioneering years, but now is kind of lacking. I will however of course try VacaSim and see what updated ! If we buy it now on OH for our Rift – will we have to buy it again for Quest? 8 on Upload, 8.8 on RoadToVR. This seems a very interesting game!